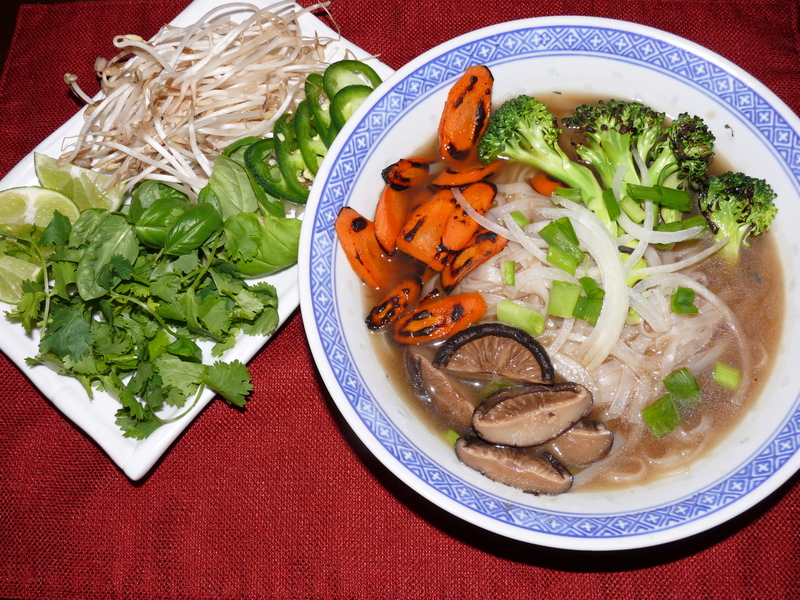 Really flavorful vegetarian pho broth is hard to find so I thought I’d try making it myself. Both charred onions and ginger, and semi-caramelized onions, along with dried shiitake mushrooms and star anise give this broth its yummy pho-ness. I thought it came out really good! I noticed that a lot of recipes online for vegetarian pho called for vegetable stock. This recipe combines making the vegetable broth along with the pho broth so you don’t need to have any vegetable stock on hand. This recipe is for 2 big bowls of pho. In a pressure cooker dry toast the star anise, cinnamon, cloves, and peppercorns for a couple of minutes. Add the oil to the cooker and heat. Then add the sliced onions, garlic and carrots and cook until they start to caramelize. While the sliced onions are caramelizing, using your oven broiler, broil the unpeeled onion and ginger flipping part way through until the skin is charred and the inside a little soft (about 15-20 minutes). 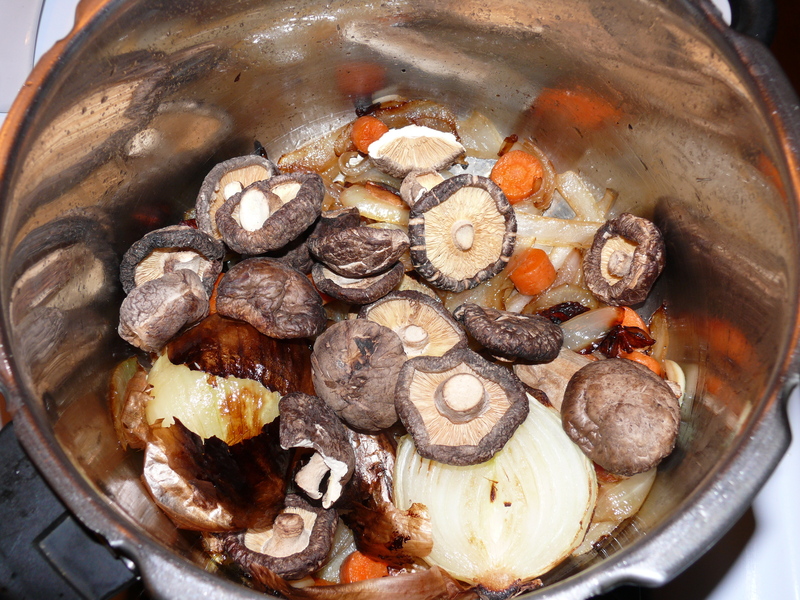 Add the charred onion and ginger (peel still on), shiitake mushrooms, water and salt to the pressure cooker. Close the cooker, turn the heat to high, then once you hear the first whistle turn the heat to medium low and cook for 30 minutes. Either let the pressure ease out on its own, or put the cooker under cool running water until all the steam comes out. Carefully open and strain out the broth, saving the mushrooms. 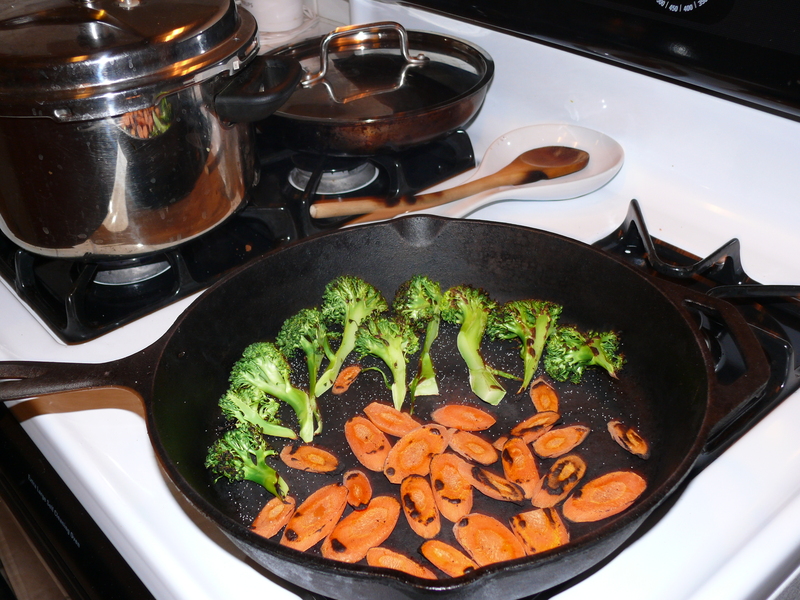 Brush carrots and broccoli with olive oil. Heat a cast iron skillet to smoking. Add the veggies in a single layer and cook on each side until just charred. Rinse the pho noodles then drop into boiling water for a few seconds. Drain and rinse with cold water. Cut the mushrooms in half. They won’t have much flavor anymore but they have a nice chew! Top with vegetables then with hot boiling broth.